Log cabin quilt top: complete! I finished this top about a week ago, but the weather was so terrible I couldn’t take any photos of it. The minute the sun came out, I darted outside with my camera and co-opted the monkey bars for a photo shoot. I am so happy with how this turned out. So happy. It doesn’t match my original vision at all (things rarely do), but I think it is beautiful in a different way. It measures 80″ x 96″, to fit a full-size bed. I’m worried about quilting it…it will be so difficult on my machine, but I would really like to do it myself. In Last-Minute Patchwork and Quilted Gifts, Joelle Hoverson calls a log cabin “a labor of love,” and it really was. I spent about a month, start to finish, on this top, which is the longest I have ever worked on any project (notwithstanding my thesis and other academic pursuits). I loved working on it, but it did get monotonous. My favorite fabrics are the cherry blossom fabric and the two Liberty prints (Lucy’s Farm), of which I have enough to make several matching pillows! I think it’s relatively balanced, which I think is quite an achievement in light of the fact that I have neither a design wall nor a floor space large enough to accommodate such a mammoth top. I know the brown (called Bronze by K.F.) is slightly overrepresented on one side, but I am not tearing it out…I like the way it is. My only issue with the process was squaring up the blocks, which seemed to take an eternity. What a wonderful sense of accomplishment! I love the mix of berries and brown! 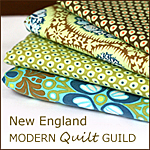 do you know how you want to quilt it? I was thinking of doing an allover fan pattern…what do you think?